Gardening is sometimes an excuse not to make books. At other times making books is the excuse not to work in the garden. Both are a reason to avoid housework. First a cucumber photo - one moment they are tiny, the next too big. The girls love them. We also have an great harvest of tomatoes, so totally different to the bought ones. This became tomato soup, which eaten cold was just fabulous. About 6 months ago I joined a group called Book Art Object. The original idea came from Double Elephant and, in her words, (far more coherent than my attempt to explain) - "a group of artists interested in books and book objects is using different texts as a starting point for making a small edition of artists' books. This is the inaugural project and about eight artists are going to make an edition of nine books each; participants will get a full set of the books and the final set will be available for exhibition." Originally one set of the books was to be entered in the 2010 Libris Awards but we later decided to work towards an exhibition later in 2010. The eight participants are Double Elephant, Amanda, Ampersand Duck, art and etc. , Ida Musidora, Dinamow, Precious Little Birdy, and myself. The theme chosen is a poem by Rosemary Dobson titled Learning Absences, 1986. We have all come at this from different directions and I could see that it possibly concerned the loss and absence of another, perhaps through separation, divorce or death. However, my primary feeling was something that concerned me personally, and that was the loss of the other person through dementia; the virtual absence of the other while still physically living in the home, and the heartbreak of living with and loving someone who no longer recognised you. I wanted to produce a tribute to my father, a loving, gentle and talented man who just drifted away from us. I wanted to do it for my mother, who never stopped loving him, even when he didn't remember her. My head was filled with ideas, sleepless nights were a pleasure as I worked out my book in my head, wrote pages of notes, developed text, made so many plans - but it was an emotional roller-coaster. A normally quite private person, I was about to make all my feelings public. That's where I came unstuck. The deeper I went into the experience the more panic stricken I became until I realised that what I was planning was way too big for me to handle, both technically, financially and emotionally. So I went back to Square 1, where I found I was out of ideas. Lots written down but I could no longer contemplate them because they weren't my Big Idea. Two months ago my mother passed away and I almost reached the point where I thought I would abandon the project altogether. However, the wonderful Double Elephant, under extraordinary difficulties, produced her set of books and my copy arrived in the mail. An exquisite book, in an embossed handmade (of course) box - my spirits lifted immediately and I knew I couldn't drop out. It has taken months for me to finally admit that I need to simplify, pare down, and - for goodness sake - make a book. Not only one book but an edition of at least nine! So, I'm again planning, drawing diagrams, making models and I think this time I'm on the way. I'm not ready yet to share any pics (I am a loner, after all) but putting this in writing is something of a committment. Now I'm still doing it for Dad and Mum but most of all I'm doing it for myself because you can't call yourself a book binder if you stop making books. I recently bought a really beautiful, very tiny book from Eva at Lady Artisan. I bought it for a gift so I'm not about to show a photo of it but I'm very tempted to buy something for myself. what a beautiful post carol - so heart felt - I really appreciate you sharing your story. and the pics of your rustic shed and yummy looking cucumbers (and kiddies) - I'm too envious of your tomatoes to make a comment on those! Well, I wouldn't mind being an old-timer on that porch! And, yes, this book has taken some of us up a very steep curve! 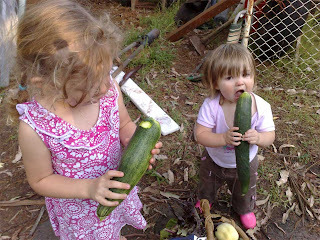 In the days when I could grow cucumbers and they became marrows overnight we ate rather a lot of them grilled with tomatoes and cheese! I hope you carry on with the project, it may be a helpful exercise for you, albeit a difficult one. I have serious garden shed envy! Lovely post, Carol. I understand what you mean, too, about simply needing to get started. I'm sure that once you get going it will feel better - don't resolve ALL the questions before you start though, leave some for discovery along the way...serendipity might well fill in the empty spaces. Great little structures, I agree. 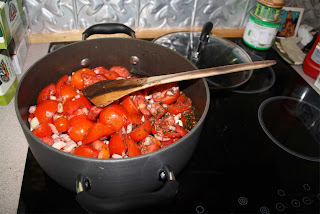 Your tomato soup looks just wonderful....and very foreign to me right now as it is so cold here, with Spring and gardening only a slight daydream! I like your book idea, and really felt honored that you would share such deep, dark thoughts on your blog, for all the world to read! LOL I guess that is why you and I get along so well: we are both loners, but open our hearts at times to those who care to read what we have to say. Very poignant thoughts about your Dad and Mum. Love, love, love Andy's garden shed. Perhaps he could come here and do some wonderful constructing for us! Hope the darned migraine is gone for good! I'm having email issues, so although I could receive your last email, was unable to respond. aRGH!!! Carol if you can bear to do it your original idea for the book sounds amazing. "the virtual absence of the other while still physically living in the home, and the heartbreak of living with and loving someone who no longer recognised you....."
Normally I don't like reading long posts on blogs, but this is so beautifully written it drew me in. I love the shed also, I showed it to my boyfriend who now has a severe case of 'shed envy'. Carol - it sounds as if you have ideas enough for a whole body of work. I think the paring down is the hard bit. I need to have a book ready at end of March and I am without ideas except for my mega-book which will take me months. oh look at the shed! It's transformed. Hope your book comes together. 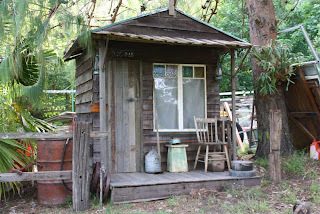 Oh, if he could build another garden shed like this for your giveaway!!!! !